Hey, teachers! How about a BiblioBattle at your school? | Mark Sloan M.D. Hey, teachers! How about a BiblioBattle at your school? I think this could be a great way to drum up reading interest in our sometimes book-averse U.S. students. The Japanese BiblioBattle has the feel of a polite poetry slam, and it could be developed along those lines in the U.S. So, any teachers out there? Does this kind of program already exist in the U.S.? Want to give it a try at your school? Please let me know what you think. Dr Sloan, I really enjoyed your book “Birth Day” and am wondering if the book has been translated into Chinese. I would love to buy some copies for my Chinese-speaking friends! I’m glad you enjoyed Birth Day! Unfortunately, there’s no Chinese translation as yet, but I’d love to see that happen. The paperback edition of Birth Day will be coming out this summer and I hope to have it more widely translated–the response to the Japanese edition has been very gratifying. So if you know of any publishers in China looking for a darn good birth book, let me know! Thank you for introducing Bibliobattle! My name is Tadahiro Taniguchi. 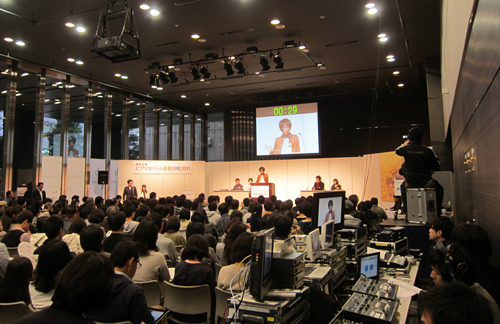 I’m a proposer of Bibliobattle in Japan, and a chairman of committee of Bibliobattle in Japan. I enjoyed Mina’s presentation in Tokyo and came to know your book. # We hosted the event and I attended the final as MC. Using Bibliobattle in classes become spreading in Japan slowly. I hope people all over the world enjoy this fantastic and beneficial game. We made a simple English web site for Bibliobattle. I’m so happy to read your blog.